Texas got four new Congressional districts in 2012. One of the new districts is District 36. Republican Steve Stockman won the election for this new Texas Congressional District 36. Steve is a conservative activist. Congressman Stockman has released a statement saying that he will be voting NO on Speaker Boehner. 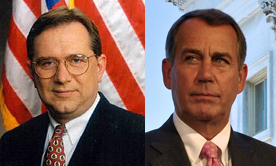 “I will not vote for or support Congressman Boehner’s bid to remain Speaker of the House. “This is not something I do lightly, but out of bedrock conservative principle and a dire need to save this nation from its current course. We cannot tolerate betrayal of conservative principle and economic reality. “I have known Congressman Boehner since I first came to the House in 1995. He is a decent man. But I have sharp disagreements with the manner in which he has handled President Obama and House conservatives. While he is all too eager to favorably negotiate with a liberal White House that has outmaneuvered him at every turn, he has been harsh and punitive in dealing with conservatives. “He has given President Obama billions in increased taxes, while unceremoniously booting conservatives from key committees without so much as the courtesy of a face-to-face meeting. Past Republican leaders, such as Tom DeLay, at least had the decency to directly tell you they were punishing you for voicing conservative principles. “The ‘fiscal cliff’ spending package negotiated by Congressman Boehner was the final, unacceptable straw. It raises taxes on more than 80 percent of families with combined incomes between $50,000 and $200,000 by an average of $1,635, while dealing special-interest tax breaks to Hollywood leftists, algae growers and millionaire wind corporations. It raises $41 dollars in taxes for every $1 in spending reductions, with no agreement to halt planned new spending of any theoretical tax revenues. The Congressional Budget Office finds it will add nearly $4 trillion to our job-killing deficit. “Each time our nation’s fiscal policies have been up for debate, Congressman Boehner has told Americans they’ll get spending cuts ‘next time.’ Enough is enough. There cannot be another ‘next time’ for fiscal responsibility, or Congressman Boehner. His acquiescence has only emboldened the liberal drive for more expensive government. Congressman Boehner has allowed Obama use to class warfare rhetoric to split the Congress. “In short, Congressman Boehner signed our country on to a fiscal suicide pact. “Unless there is drastic change to the United States’ taxation and spending trajectories our government will become insolvent and our economy will collapse. Obama’s 50.8 percent of the vote is not a mandate for higher taxes and more spending that majorities of Americans oppose. Congressman Stockman was a member of the 1994 “Republican Revolution” freshman class of the 104th Congress, serving one term from 1995 to 1997. Congressman Stockman returns to the U.S. House of Representatives in 2013 with a vision of limited government and strong support for American families, robust military and a balanced budget. During the first 100 days, Congressman Stockman fought to reduce the size and scope of the federal government, starting with Congress itself. As sponsor of the Drier/Stockman package of opening day reforms, Congressman Stockman dramatically pared down the hierarchy of the House by eliminating three full house committees, 23 subcommittees and cutting committee staff by one-third saving taxpayers millions of dollars each year. Congressman Stockman voted to cut taxes, his own pay and pension, and the number of congressional committees. Congressman Stockman never asked for nor received a federal earmark to benefit his district. Instead, he believed the best “earmark” he could do for his district was to leave a balanced budget for the next generation. Congressman Stockman’s opening day reforms required Congress to operate under the same laws as everyone else and eliminated many of the “perks” the former Democrat-controlled Congress had enjoyed. They also required Congress, for the first time, to open Congressional proceedings each day with the Pledge of Allegiance. Some of the awards and commendations awarded Congressman Stockman were the “Taxpayers Best Friend Award” by Citizens for Tax Reform; a consistent “100 percent” rating by the American Conservative Union; “Taxpayer’s Hero Award” by Citizens Against Government Waste and “Pro-Family Congressman” of the year by the American Family Association.